Here’s another sample from my forthcoming book from Hydra Publications. Human or not, Nerissa took no one’s fancy that evening. Nerissa had no fear of this old taunt and she was too tired to respond with the proper display of terror. “You don’t believe me?” Barand shook her. “Do you give orders now?” He slapped the girl, thrust her into a lightless alley, and threw her to the ground. Doubling both his hands into fists, he waited for her to get up. Instead, Nerissa groped, clutched the first thing she touched, and pitched it at the man. The thing turned out to be a cobble and it hit him with a solid thunk. He staggered back, shook his head, and sat down. Nerissa scrambled up and ran into the alley’s blackness. He was after her in a moment but his heavy boots were easy to hear and he had to stop now and then to strain for the sound of her bare feet. She tried to choose her route but found herself taking the first turns and narrowest ways. She was away now, and the fear of being caught and hurt again outweighed her craft and caution. Halfway down a passage between two warehouses, she knew she had lost her race. She knew where she was and she knew there was no way out. She ran to the wall at the end of the passage; she cast herself against it as if she would force her body through it. The brick was solid. No windows, no doors, its top at twice her height. She huddled in the dark. Maybe Barand would miss this turn. If he only glanced in, he’d never see her. She heard him stop. She heard the hiss of his boots on the gritty street as he turned. She heard him coming nearer. To her horror, the passage lightened as the clouds thinned. In a handful of seconds, the moon would show her clearly. Something passed her with a whir. From near the mouth of the passage came a trill of music more lovely than anything the girl had ever heard. A bird sat on a ledge of one of the warehouses, stretching its throat in song. There were no colors in that light, but the bird was pale, with long and drooping tail-feathers. Barand stared at it, too. If only she could creep away while Barand was looking at it. Impossible. But, in the moonlight, Nerissa saw the impossible could happen. There was a vertical crevice in the wall where none had been before. Nerissa took to it like a rabbit to a warren. She had to step up into it and wriggle back…. And she was trapped. The crack went deep – deeper than most walls were thick – but it didn’t open on the other side. She heard Barand shout as he saw her go to ground. She saw him, through the cleft, pound toward her. The entrance exploded with song and feather, as the bird returned. Nerissa could see, in a light the bird seemed to contain rather than reflect, that its beak and feet were yellow and that its feathers shimmered like liquid fire. Red, blue, black, glinting with diamond sparks. Its eyes…its eyes were blue…. Barand’s grimy hand took the pretty creature by the throat. He snapped its neck with a movement of his thumb and tossed the corpse behind him. Nerissa gasped, breathless with shock and fury. She braced herself and made claws of her hands, determined she’d leave her mark on that man if she paid for it with her life. Barand put a foot up into the entrance of the crevice. Surprise and uncertainty brushed his face as he saw her braced to meet him. Before either of them moved, there was a rush of brightness. Barand drew back, a spot of blood on one cheek. Another bird like the first perched at the edge of Nerissa’s sanctuary. “Killed your mate, did I? Well, don’t be lonely.” As he reached for the bird, it flew at him, pecking and clawing. His hands met around it and it fell dead on the empty stones. He came back to the pocket in the brick, to find another bird there trilling a silver war song. Barand’s eyes met hers as he twisted the shining head. Nerissa heard the bird’s neck crackle as Barand broke it. She heard the little body hit the cobblestones but couldn’t see past the new bird, the living bird, now blocking the way. Barand cursed and knocked it aside. It fluttered up, stooped, and struck his ear with taloned feet. It drove its beak at his eyes. The man screamed and tore the creature off. His blood flew, black in the silver light. He slung the bird at the nearer warehouse. Nerissa heard it hit but didn’t hear it fall. She worked her way forward until she could see all of the passage. There was Barand, mopping his ear and face with his sleeve, cursing in a whining drone. There were the stones of the street around him. She could see no shining feathers, no broken bodies. Yet he had killed four birds…. Barand stopped cursing. He had seen her standing unprotected. He lunged. Feathers blinded him, steel hooks tore at him, the point of a living dagger dug into his face. Shrieking, he grasped the bird, flung it to the stones, and crushed it beneath his foot. Still shrieking, he threw his arms up to cover his head from another attack. When the singing started, Barand shut his mouth and lowered his arms. A shimmering bird sat in the entrance to the crack in the wall, its five long tail-feathers curled about its feet, its wings folded, music pouring from its opened beak. It was the only bird in the passage, alive or dead. Barand stumbled backwards, swiping at the blood on his swelling face as if it contaminated him. At the mouth of the passage, he turned and ran. The bird flitted after him. Nerissa didn’t remember wriggling out of the crevice. One moment she was in it; the next, she stood by the wall, which was once again unbroken. I must have run my head into it – knocked myself out – dreamed the rest. She felt her head for tenderness or lumps but found none. At any rate, she was free. MAN, I loved writing this book! 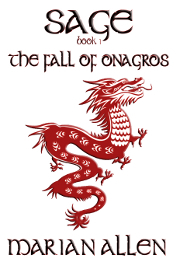 The Fall of Onagros, Book 1 of SAGE is available for Kindle and at Smashwords (for multiple formats including Kindle). The print version is coming soon. A WRITING PROMPT FOR YOU: Write a scene with a bird in it. This entry was posted in SAGE, Sample Sunday. Tagged Bargain With Fate, book excerpt. If You Can’t Stand the Heat …. Great story, Marian! Would make a super Tales from the Crypt, Night Gallery, or other spooky type show episode. It’s even better than the Perry/Mermaid story! Really excellent in every respect! Thanks, Perry! There’s lots of humor in this trilogy, but lots of really dark creepiness, too. And it couldn’t be better than the Perry/Mermaid story, because Perry isn’t in it! Maybe I should have had the girl saved by a handsome, self-deprecating humorist who slides in on a zip-line and scoops her up and away!